"ที่" แต่ละที่มีขนาดคือ ขนมปัง 25 กรัม, มันฝรั่ง 100 ก., พาสตาสุก 50-60 ก., ผัก 100 ก., แอปเปิล 80 ก., กล้วย 60 ก., ส้ม 100 ก., แตงไทย/แตงโม 200 ก., องุ่น 30 ก., นมหรือโยเกิร์ต 1 ถ้วย, ไข่ 1 ฟอง, เนื้อ 60 ก., พืชพวกถั่ว (สุก) 100 ก. ↑ "Decision of the Intergovernmental Committee: 5.COM 6.41". UN Educational, Scientific, and Cultural Organization: Intangible cultural heritage. 2010. Archived from the original on 2018-11-10. สืบค้นเมื่อ 2018-11-10. ↑ 4.0 4.1 Rees, K; Hartley, L; Flowers, N; Clarke, A; Hooper, L; Thorogood, M; Stranges, S (2013-08-12). "'Mediterranean' dietary pattern for the primary prevention of cardiovascular disease". The Cochrane Database of Systematic Reviews. 8: CD009825. doi:10.1002/14651858.CD009825.pub2. PMC 4176656. PMID 23939686. ↑ 5.0 5.1 5.2 5.3 5.4 Dinu, M; Pagliai, G; Casini, A; Sofi, F (2017-05-10). "Mediterranean diet and multiple health outcomes: an umbrella review of meta-analyses of observational studies and randomised trials". European Journal of Clinical Nutrition. 72: 30–43. doi:10.1038/ejcn.2017.58. PMID 28488692. ↑ "UNESCO Culture Sector, Eighth Session of the Intergovernmental Committee (8.COM) - from 2 to 7 December 2013". สืบค้นเมื่อ 2014-04-03. ↑ "UNESCO - Culture - Intangible Heritage - Lists & Register - Inscribed Elements - Mediterranean Diet". สืบค้นเมื่อ 2014-04-03. ↑ 12.0 12.1 Martinez-Lacoba, R; Pardo-Garcia, I; Amo-Saus, E; Escribano-Sotos, F (2018). "Mediterranean diet and health outcomes: a systematic meta-review". European Journal of Public Health. Advance articles. doi:10.1093/eurpub/cky113. PMID 29992229. ↑ Ajala O.; English P.; Pinkney J. (2013). "Systematic review and meta-analysis of different dietary approaches to the management of type 2 diabetes". The American Journal of Clinical Nutrition. 97 (3): 505–516. doi:10.3945/ajcn.112.042457. ↑ Schwingshackl, L; Missbach, B; König, J; Hoffmann, G (2014-08-22). "Adherence to a Mediterranean diet and risk of diabetes: a systematic review and meta-analysis". Public Health Nutrition. 18: 1–8. doi:10.1017/S1368980014001542. PMID 25145972. ↑ Schwingshackl, L; Hoffmann, G (2014-10-15). "Adherence to Mediterranean diet and risk of cancer: a systematic review and meta-analysis of observational studies". International Journal of Cancer. 135 (8): 1884–97. doi:10.1002/ijc.28824. PMID 24599882. ↑ Singh, B; Parsaik, AK; Mielke, MM; Erwin, PJ; Knopman, DS; Petersen, RC; Roberts, RO (2014). "Association of mediterranean diet with mild cognitive impairment and Alzheimer's disease: a systematic review and meta-analysis". Journal of Alzheimer's disease : JAD. 39 (2): 271–82. doi:10.3233/JAD-130830. PMC 3946820. PMID 24164735. ↑ "The Oslo definitions for coeliac disease and related terms". 2013. doi:10.1136/gutjnl-2011-301346. ↑ "Spectrum of gluten-related disorders: consensus on new nomenclature and classification". 2012. doi:10.1186/1741-7015-10-13. ↑ 34.0 34.1 34.2 Willett, WC; Sacks, F; Trichopoulou, A; Drescher, G; Ferro-Luzzi, A; Helsing, E; Trichopoulos, D (1995-06-01). "Mediterranean diet pyramid: a cultural model for healthy eating". American Journal of Clinical Nutrition. 61 (6): 1402S–6S. doi:10.1093/ajcn/61.6.1402s. PMID 7754995. ↑ Tapper, Richard; Zubaida, Sami (2001). A Taste of Thyme: Culinary Cultures of the Middle East. Tauris Parke Paperbacks. p. 43. ISBN 1-86064-603-4. ↑ แม่แบบ:CC-notice "Definition of the Mediterranean Diet: A Literature Review". 2015. doi:10.3390/nu7115459. 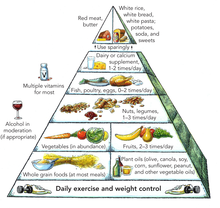 ↑ "Mediterranean Diet Pyramid". สืบค้นเมื่อ 2013-02-27. ↑ "Mediterranean diet pyramid today. Science and cultural updates". 2011. PMID 22166184. ↑ "The emerging role of mediterranean diets in cardiovascular epidemiology: Monounsaturated fats, olive oil, red wine or the whole pattern?". 2004. PMID 15012018. ↑ Willett, WC (2006). "The Mediterranean diet: science and practice". Public Health Nutr. 9: 105–10. PMID 16512956. ↑ "Serge Renaud: from French paradox to Cretan miracle". 2000. doi:10.1016/S0140-6736(05)71990-5. ↑ Castelvetro. G., The Fruits, Herbs, and Vegetables of Italy, London, Viking, 1989, translated from the original published in 1614. หน้านี้แก้ไขล่าสุดเมื่อวันที่ 3 ธันวาคม 2561 เวลา 13:54 น.